One of the most highly anticiapted films of the competition at Berlin is the world premiere of Robert Altman’s Prairie Home Companion. The screenings were held yesterday, and by screenings I mean the press screening and the huge public red-carpet premiere. 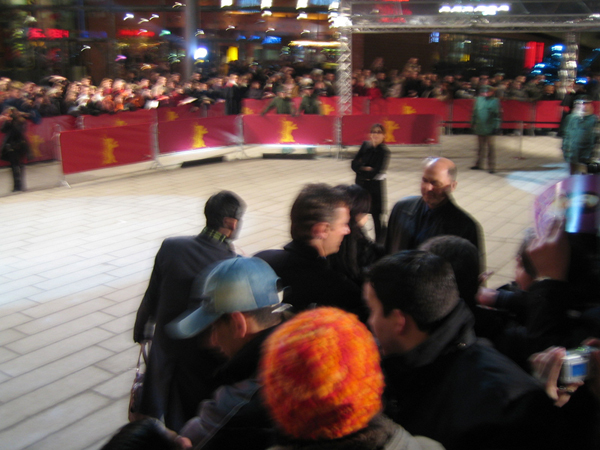 Like all competition films, there is a screening for the press and industry in the huge Berlinale Palast which has about 1,800 seats in the morning and early afternoon. The evening premieres are an ordeal taking up to 4 hours. As an industry member I can get tickets to these red-carpet affairs, but the tickets are in the top two of the vertigo-inducing balconies. In addition to the screening, most evening screenings include a presentation of Shooting Stars, a dog-and-pony show for emerging “stars” which is also broadcast on German television. In addition to showing up a 45 minutes early to claim a seat, one has to sit through an hour of the talent show before the real stars are paraded out and the screening can actually begin. Not having time for that pain, I opted to attend the press screening in the afternoon and I’ve never seen as many press delegates pushing to get into the screening. The press has priority for seating, so I’m glad that I showed up 45 minutes early to wait for any of the available seats. Most press screenings fill the main floor, but this one was packed. I started getting nervous as we weren’t allowed to enter and it was three minutes to showtime. Then, there was the announcement. Only 30 industry people would be let in, but we’d have to sit in the top balcony. I was one of the lucky 30, but my seat was in the back row. It took several minutes to get over the dizziness. I have to admit to not being a fan of the broadcasts of Prairie Home Companion. In fact, I’m still a bit unnerved upon hearing the opening of the show by accident when MPR revised their broadcast schedule. I had expected to hear Click and Clack of Car Talk and PHC was more than sloppy seconds, it was a audio assault. This said, if you like PHC, you’ll love this film. I thought there would be more narrative to drive the action of the film, but it’s slight. The film really focuses on the performances of the live broadcast which will be a treat to PHC admirers. Not being one of those, I was left to marvel in the complex cinematography of Ed Lachman which will be nominated for an Oscar next year, I’m sure. I was also curious as to how an international audience would react to the film, not being familiar with the radio broadcast. Most of the press was positive and did translate well with a broader audience. The red-carpet arrival of the stars managed to occur when I was between two screenings, so I did make my way through the crowd to get a couple photos. Meryl Streep, Robert Altman, Woody Harrelson, and Lindsay Lohan all walked the red carpet. If you look closely you’ll see Lohan a few feet away from me signing autographs. While this was a treat, there was so much other viewing going on throughout the weekend. Some of my top picks over the weekend were mostly documentaries. Amos Gitai’s final section of his House trilogy, Close to Home, followed up on Israeli and Palestian families who have lived in one house in the disputed zone over 60 years. Matthew Barney No Restraint followed Barney and Bjork on their collaboration during the production of Drawing Restraint 9 set on a Japanese whalining vessel. China Blue showed the exploitation of young women from the Chinese provinces who more into large industrial areas to work in sewing factories. This, along with Workingman’s Death, show the real price of globalization among the people who are not profiting from the new capitalism. Two new revelations for me were Royston Tan’s 4:30 from Singapore and Pavee Lackeen: The Traveller Girl from Ireland. With minimal dialogue, Tan creates a dark tale about a young boy who becomes obsessed with his mother’s boyfriend who is taking care of him while his mother is working abroad. Both are desperately lonely and disconnected. The boy is so desperate for attention that he wakes up at 4:30 each morning to go through the boyfriend’s room while he sleeps. The relationship becomes increasingly disturbing and Tan crafts a dark visual style and sound design that is tense. Perry Ogden’s rough cinematography packs a visual punch and the actors are so natural that it seems more like a documentary. These technical features add to the gut-wretching poverty and frustration experienced by the 10-year old girl, one of ten children living in a trailer on the outskirts of Dublin. There is sure to be more powerful films in store tomorrow. Stop back for a new report on Drawing Restraint 9 (with a dialogue following with Competition Jury member Matthew Barney–I wonder what he thought about PHC), Wild Tigers I have Known (highly recommended by B. Ruby Rich at the dinner after her Regis Dialogue with Lili Taylor earlier this month), a conversation with Charlotte Rampling (Competition Jury president) and Peter Cowie, and Broken Sky a new film by the Mexican director Julian Hernandez. Earlier: The first dispatch from Berlin. Also, Drawing Restraint 9 will be screened at the Walker in May. Tickets are not yet on sale; to get first word on tickets, sign up for the Walker email alerts or RSS calendar feed.